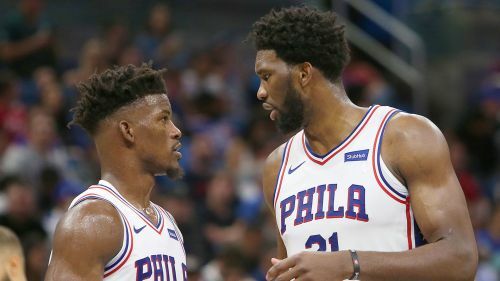 Philadelphia 76ers star Joel Embiid said his new role following Jimmy Butler's arrival is upsetting his game. Embiid missed Friday's 117-111 win over the Detroit Pistons due to "rest" amid his poor run of form for the 76ers. The NBA All-Star was just five-of-17 from the field for 10 points in Philadelphia's loss to the Eastern Conference-leading Toronto Raptors. Embiid, however, said he is feeling fine and explained that his struggles are down to the way he has been used by head coach Brett Brown since Butler was acquired from the Minnesota Timberwolves. "But it seems like the past couple games, like with the way I play, our setup, [Brown] always has me starting on the perimeter … and it just really frustrates me. My body feels great, and it's just I haven't been playing well." Embiid rested one game removed from tying a season-low scoring output with 10 points. His 25 points over his last two games was his worst two-game stretch of the season. However, since Butler has been integrated into the 76ers line-up, Embiid's numbers have stayed steady. Before Butler arrived, Embiid was averaging 28.2 points but now he is putting up 23.8. And, if his recent three-game slump where he scored a total of 41 points is not factored in, he is averaging 27.6. The former Kansas Jayhawk is struggling of late, but his head coach is not sure it has much to do with Butler. "I do not see the connection of Jimmy having much to do with spacing," Brown said. "In fact, I think it completely enhances the possibility to have better spacing." NBA 2018-19: Can Jimmy Butler really bring the Philadelphia 76ers back?